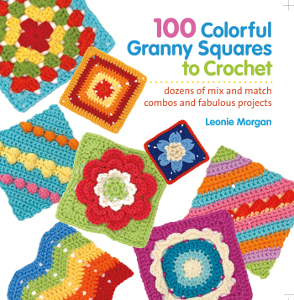 Author Leonie Morgan create the most amazing and colorful collection of granny squares that I have ever laid eyes upon. Flipping through these pages is like a rainbow of patterns just waiting for you to pick up your hook and crochet each and every one of them. 100 granny squares may seem daunting, but not with this book. Each pattern takes up just two pages and includes crochet charts and close up photos. Ranging from beginner to advanced, these granny squares are perfect for any level crocheter. Start with beginner patterns and make it you goal to work your way up to the more advanced squares. Either way, this book makes a great gift for a friend or for yourself. With this book, you can crochet a granny square afghan that shows off your crocheting abilities. As a crocheter, this book fills my head with great and wonderful ideas for colors, patterns, and other ways to use granny squares. This is a must have book for any crocheter looking to expand their horizons and crochet modern granny squares.